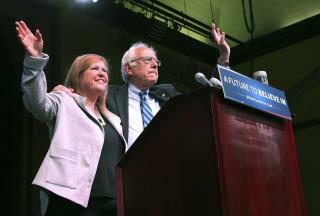 (Newser) – Monday was a very sad day for Burlington College in Vermont: The tiny liberal arts institution announced that it's closing this month under the "crushing weight of debt" of a land deal from Jane Sanders' time in charge, reports the Burlington Free Press. Bernie Sanders' wife, who ran the private college from 2004 to 2011, tried to boost enrollment in 2010 by buying 32 acres of land along Lake Champlain for a new campus. The land, including a 77,000-square-foot main building, was being sold by a Roman Catholic diocese that needed cash after being sued by abuse victims. But the college, which has around 70 students, was unable to attract enough new students to justify the $10 million purchase and ended up in deep financial trouble even after selling all but 8 acres of the land, Politico reports. If Bernie were the nominee, this is exactly what Hannity on Fox would make the centerpiece of his programs. Republicans would be holding hearings & blow this out of proportion in front of the country. The GOP has gerrymandered The House. Hearings against Jane would also require a "President Sanders" to testify before Congress. Bernie is known for losing his control easily. The above is only a taste of what conservatives would do to the senator. They've been holding back from how much they hate their false perception of what socialism is. Yeah, borrowing your way out of debt really works well, huh. Who was crazy enough to lend them $10 million anyway? On a much larger scale, this is what will happen to our country if Bernie gets elected. All the freebies will bankrupt the country!